Who doesn’t want more search engine traffic? 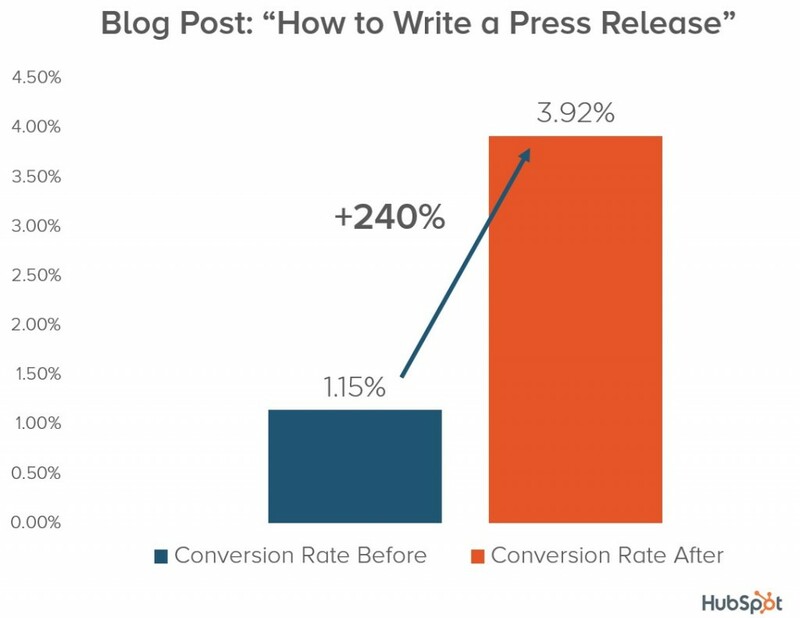 One of the main reasons we publish content is in hopes of attracting it. Just the tiniest fraction of the 213 million searches done per day can make or break a business. But as you know, there’s a lot of competition for that traffic. Millions of pages compete for every search. That’s why you need every edge you can get. Of course, we don’t want you to do anything shady – we do not recommend “black hat SEO”. But there are plenty of ways to improve your search engine optimization that most people overlook. One of the best ways to find those opportunities is to understand how search engines work. But you have to take even that a step further. I’m talking about going beyond the ABCs of SEO and looking into some of the lesser-known factors that influence your rankings. To do that, we’re going to have to talk a little tech. I don’t want you to fear that. Some people get really alarmed about SEO discussions because they think they aren’t technical enough to follow along. Frankly, that’s bunk. My mom could understand this – so could yours. Especially if we break the lingo down, and explain things in plain language. So here’s the first place to start – with things called “search ranking signals” (or sometimes called “search ranking factors” – they’re the same thing). What are they? Well, all the things that contribute to search engine optimization are “search ranking signals”. Some ranking signals are more or less important. Some aren’t known by many people. In this post, I’m going to walk you through the content ranking factors not known by many marketers. We’ll break down what we know the search engines are tracking so we can apply it to your content development. First thing to know about ranking signals? There are a lot of them. Over 200. They break into two different types: “on page signals” and “off page signals”. Don’t stress if you haven’t heard those terms before. They mean exactly what they sound like they mean. “On page signals” refer to things on your pages that affect those pages’ ranking in the search engines. For example, meta and title tags are “on page” signals. “Off page signals” refer to search engine optimization factors that are not on your pages. Stuff like links pointing to your site, or how often your pages are mentioned on social media. Not all signals are created equal. Some have far more sway over how your pages are ranked than others. For instance, the title tags on your pages have much more influence over how your pages rank than the ALT tag you use for the images on those pages. Of course, both title tags and ALT tags are text elements. They’re both in tags on your pages. But Google (and the other search engines) place far more weight on title tags than on ALT tags. That doesn’t mean the poor alt tags don’t help with SEO. But if you had to focus on one thing, pick the title tag over the alt tags. There are several reports that will show you which ranking signals carry the most weight, but here we’re focused on the lesser-known things that can affect how your pages rank, and how to create content that gets ranked better. Got a lot of old pages on your site that haven’t been updated in a year or more? It might be worth your time to refresh them. How much of a boost you get will depend on how extensively you update your pages and how often you make those updates. But think more in terms of replacing or rewriting whole sections rather than just changing a few words. For frequency of updates – at least one a year is respectable. Every six months is even better. 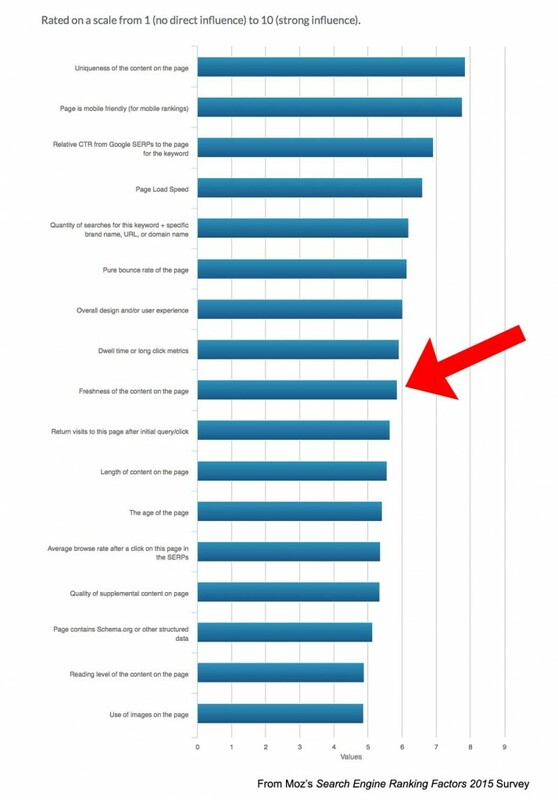 The Moz 2015 Ranking Factors study broke out the overall freshness of the entire site versus the freshness of individual pages. This suggests that if you can’t get to update every age on your site, it’s okay – go after the pages getting the most traffic or the most leads (or both). Just having some major pages updated regularly will give the rest of your site an incremental lift. As search engines have become more sophisticated, they’ve honed in more and more on “user experience signals” – how easy a page is to interact with and to read. Reading level is one of those signals. Reading level is one of the more misunderstood ranking signals, mostly because the idea of reading level itself is often misunderstood. Many people believe an essay that’s written at a higher reading level is “better” than one written at a lower reading level. In other words, it’s widely believed that an essay written at a 15th-grade reading level is better than one written at a 7th-grade reading level. That’s not true. Especially if you want people to read your copy. “Lower” reading levels are preferred by almost all readers – even PhDs. Old school copywriters traditionally wrote at a 5th-grade reading level because they knew people were more likely to keep reading their copy. Please understand that a “lower” reading level does not mean dumbing down your message. It doesn’t. It means writing more clearly. That’s often more work for the writer than writing at a higher grade level. It means the writer has to do more thinking to distill and articulate their ideas more succinctly. It usually means much more editing is required, too. What this chart means: On average, the ten pages at the top of the search results have an average Flesch score of 76.19. The higher a Flesch score, the easier the text is to read. From 2014 to 2015, the average Flesch score of top pages has increased – that’s why we say this ranking signal is becoming more important. Compare how important reading level is to the other ranking signals in this chart. Remember how HTTPS was hailed as being a big deal in SEO about a year ago? 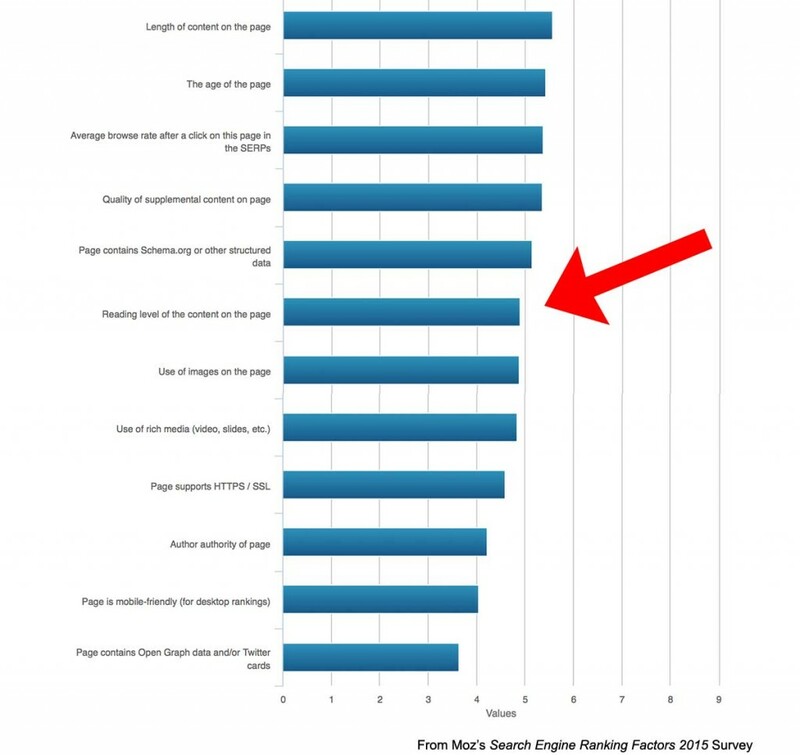 According to this survey of SEOs, reading level actually has more weight over how a page ranks in the search results. 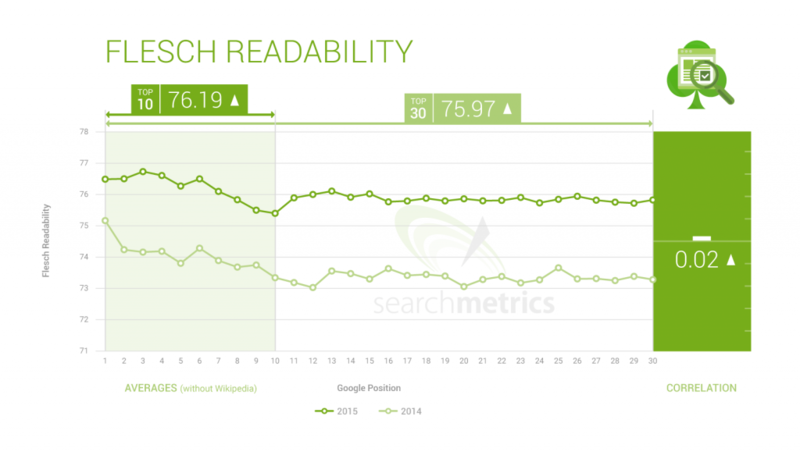 One more thing: Moz expects readability’s influence over the search algorithm to continue to increase over time. There’s that bias against “lower” reading levels I mentioned before. Want to know how your pages rank? Use the Readability Test Tool if you want to paste in the URL of an already published page. If you’re working in WordPress, install the Yoast SEO plugin. In addition to a slew of great SEO features, it’ll also score your copy according to the Flesch formula. This last point isn’t about just one ranking signal – it’s about a bunch of very similar signals. But they’re all so closely related I felt it would be best to group them together. All the ways we dress up our content matter. They matter to our readers, of course. But they also matter to Google (probably because the user experience is becoming more and more important to rankings). Google wants to please human readers, so the algorithm has been adjusted to mimic what a real human would want. 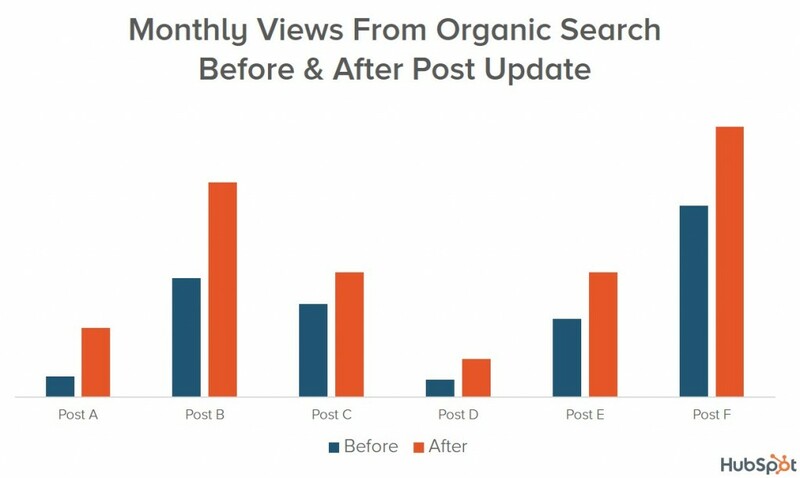 If you look at the charts from the Moz reports above, you’ll notice many of these content formatting signals. Both “Use of images on the page” and “Use of rich media (video, slides, etc. )” were ranked above HTTPS / SSL in terms of influence. I’m sure you’ve heard it said before: “Just make great content and your pages will rank.” That’s true to a certain extent, though you’ve still got to get the technical parts of SEO right. But once you look deeper into the search ranking signals reports, you can see how specific our instructions are for making “great content”. There are a bunch of other content-related ranking signals I didn’t mention here for the sake of space. Do you think any of the ones I left out are particularly important? Speak your mind in the comments. 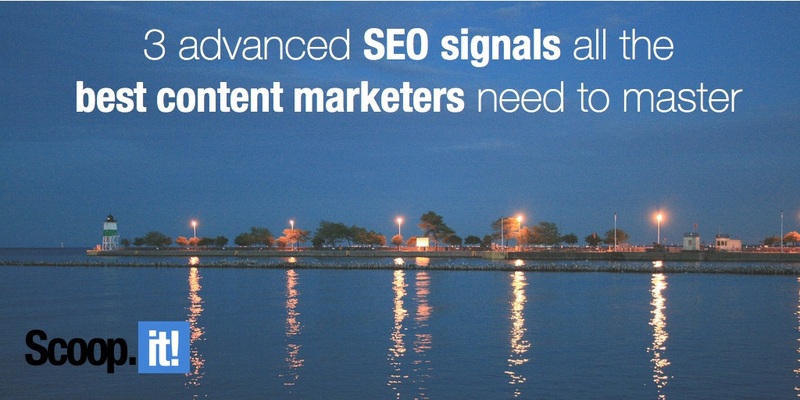 4 Comments on "3 advanced SEO signals all the best content marketers need to master"
So glad you liked it, Alexendra. Thanks for letting us know. While I’m not sure these qualify as ‘advanced’ signals, I think they speak to the idea that “SEO” is very much related to usability. Skimmable content that’s easy to read makes for a great user experience, and all companies would be wise to implement it. Agreed on both points Jason. Perhaps “lesser-known SEO signals” would have been better. In terms of skimmable content, you bring up an interesting idea: Content usability. Usability both in the sense that the content is easy to consume, and that it’s something audiences want to consume – which is not “hard-sell” or overly salesy content. That seems to be where we’re headed if we want engagement from our audiences, and if we want more search engine traffic. We’ll be publishing another post about that very topic soon.